The bookplate, or ex libris, is a label giving the owner’s name pasted into a book, or on occasion used to record donation ofthe book to a library. In the western tradition, the bookplate arose in Germany not long after the invention by Johann Gutenberg of printing from moveable type around 1440-1450; the earliest known examples are woodcuts from the late fifteenth century. Since that time, bookplates have been created using the entire range of printmaking and typographic techniques available including, in the modern era, photography and computer aided design. The first recorded bookplate British collector was Miss Sarah Banks (1744-1818), sister of Sir Joseph Banks. Her collection of approximately 180 bookplates formed but a minute part of her ephemera collection which was presented to the British Museum after her death. The first collectors on a larger scale were a Miss Jenkins of Bath, active in 1820, whose collection is now in the British Museum, and the Rev. Daniel Parsons (c. 1811-1887). The latter wrote the first recorded article on bookplates, published in 1837 in the Oxford Genealogical and Heraldic Society’s Third Annual Report. 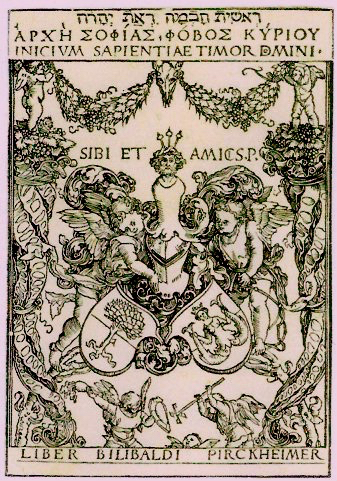 Examination of the Banks and Parsons collections suggest that collecting bookplates evolved from the pastime of collecting or preserving coats of arms. 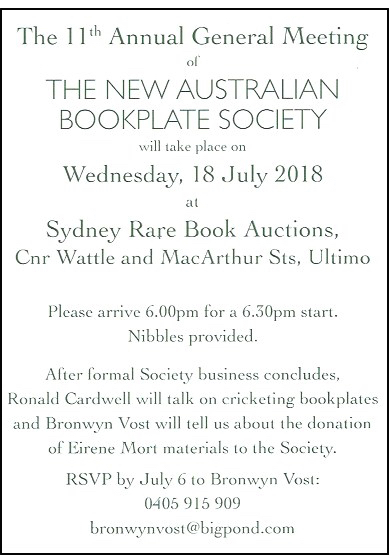 As bookplate collecting gathered momentum in the late nineteenth century, the Ex Libris Society was formed in London in 1891, and this interest was trans-planted to Australia by a small number of passionate collectors of bookplates largely in armorial form. Around this time, Sydney solicitor John Lane Mullins commissioned the first Australian pictorial design, and in 1923 he became the founding president of the Australian Ex Libris Society which lasted until 1939, when Lane Mullins’ death and the outbreak of World War II led to the Society’s demise. A brief revival in interest occurred in 1941-4 in Melbourne with the Australian Bookplate Club, but organised collecting had to wait another half century until the formation of the Australian Bookplate Society, which at the present time focuses on an Australian Bookplate Design Award through the Keith Wingrove Memorial Trust. 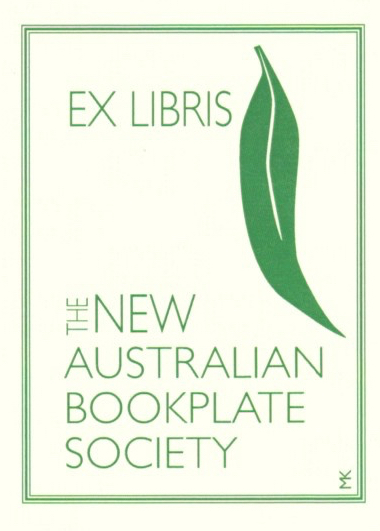 The New Australian Bookplate Society was unofficially launched at a bookplate exhibition held at Blackheath's Stop Laughing This is Serious Gallery in October 2005, attended by artists and other lovers of bookplates. A year later on 22 October 2006, a meeting to officially form the Society was held in the Edward Ford Room of the Royal Australasian College of Physicians in Macquarie Street, Sydney. The purpose of the Society is to raise awareness of the art of bookplates among printmakers, collectors and the general public. At present there are approximately 80 personal and institutional members distributed in almost all Australian states as well as New Zealand, the United Kingdom and the United States. 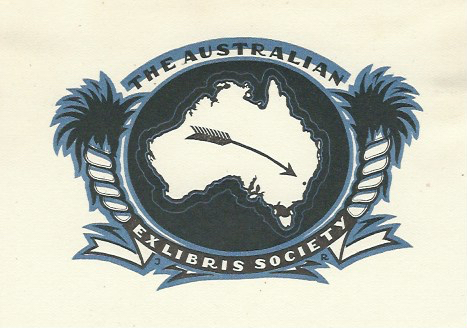 More information on the history of Australian bookplate societies can be found on this page. The flagship of the society is its quarterly, full-colour Newsletter, which publishes a range of illustrated articles, letter and notes on historical and contemporary aspects of bookplates. Contributions are invited from members and non-members; any enquiries should be directed to the Editor, Dr Mark Ferson on +61 401 141 890 or by email at m.fersonATunsw.edu.au More information is available on the Newsletter page. For information on joining the Society, please go to this page. After the excitement of 2016 when we celebrated the Society’s tenth anniversary with a successful Design Award, published an index to Newsletter numbers 21-40 and sundry other activities, 2017 was a quiet year for the Society in comparison. Paid membership of the Society remained stable at 67, of which 56 covered the hard copy Newsletter and 11 the digital membership. We gained 7 by awarding gratis membership to the winners and runners up in the Design Award (and I have to tell you, although it is officially news for the next AGM, that several of them have stayed on as paying members in 2018). Although the Financial Report is the next item, I would like to take this opportunity to thank a number of members made generous donations to the Society, increasing our subscription based income by roughly a further 20%. Our four issues of the Newsletter were well received and in addition to thanking Mary Keep once again for her devotion to its beautiful design, I would like to express my gratitude to contributors Christine Bell, Ronald Cardwell, Marie Larsen, Edith May, Neil Morse, Monica Oppen (who went above and beyond by hand printing sheets of bookplates as a Newsletter insert) Michael Taffe, Peter Thomas, Bronwyn Vost and Jürgen Wegner; also Rhyll Plant for printing off large numbers of her charming Christmas magpie bookplate to include with the December number. 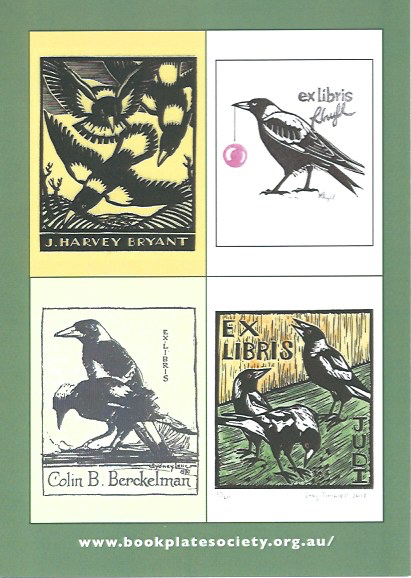 Speaking of bookplates, you will note the magpie theme of this year’s AGM invitation card, and I would like to thank Rhyll for allowing us to use her bookplate and Edwin Jewell for permission to use the design for his wife Judi by Adelaide artist Lucy Timbrell. Thanks are due to Bronwyn for organising the May ‘show and tell’ held at the previous Annandale address of Sydney Rare Book Auctions, for organising the AGM and for her other activities which have served to raise the profile of the Society and of which you will hear (and see) more later this evening. I wish to express my gratitude to the Society executive and committee, Ronald Cardwell and Nick Ingleton, both of whom have excellent ideas which we just need to find ways of turning into action.